Since ancient times human beings have gathered together for social purposes. And since not very long after that writers have written about these occasions. The party is a useful literary device, not only for social comment and satire, but as an occasion where characters can meet, fall in love, fall out or even get murdered. A Curious Invitation features forty of the greatest fictional festivities. Some of these parties are depictions of real events, like the Duchess of Richmond’s Ball on the eve of battle with Napoleon in Thackeray’s Vanity Fair; others draw on the author’s experience of the society they lived in, such as Lady Metroland’s party in Evelyn Waugh’s Vile Bodies; while yet others come straight from the writer’s bizarre imagination, like Douglas Adams’ flying party above an unknown planet from ‘The Hitchhiker’s Guide to the Galaxy’. Suzette Field offers you the chance to gatecrash these parties, spanning most of the history of human civilization, seen through the eyes of the world’s greatest writers. In A Curious Invitation, Field dissects the festivities of fiction across genres, timeframes and locations. Delving into some of our favourite novels and works of fiction she unpicks the social events that give us a deeper understanding of the contexts of the works and their characters. This invaluable guide is written with a professional eye and is full of wit and apercus. Books and parties go well together in my view, and my fellow Old Roedeanian Suzette Field clearly agrees. She has written a book about parties. 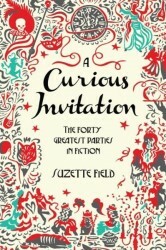 A Curious Invitation (Picador) is her review of what she considers to be the 40 greatest parties in literature, a subject that I suspect could become a dinner party topic in its own right . . . The party to celebrate all these imagined parties is being held on October 26 ... She is staging what is billed as 'a Halloween ball in an abandoned picture palace' in London, where she will be recreating five parties from her book.